Powers/Abilities: Fen Gur was a conjurer of illusions. He could cast simple and complex illusions, near or far from him. His magic enabled him to animate simple objects and even a dead body (potentially even a form of telekinesis). He also could project his voice at a distance of 100-200 steps. His agility was higher than a normal man. 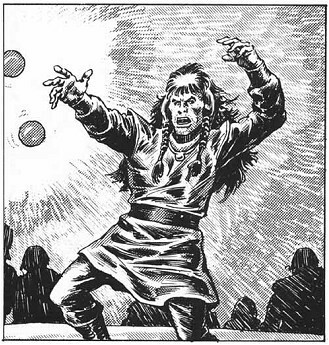 (Savage Sword of Conan#161/2) - Fen Gur lived entertaining people with his ability as an illusionist. One day, while performing in the Crystal City, Fen Gur attended to a fight between King Kull, usurper of the throne of Valusia after killing the tyrant Borna, and the followers of the self-proclaimed heir to the throne, Ralim. Fen Gur understood that his abilities could be of great help for the King. That night, Fen Gur climbed the wall of the Royal Palace and sneaked into the royal chambers succeeding in speaking to King Kull and telling him his plan. Several days later, Ralim gathered his followers to assault the palace. When the gates opened, he spotted a familiar figure before him. To Ralim, it was the talking cadaver of King Borna, but was actually corpse secretly animated by Fen Gur. The rotten, talking, advancing body terrorized Ralim, who then confessed that he was not the real son of Borna. Fen Gur had the cadaver strangle Ralim and claim that this would be the revenge against whoever used Borna's name in vain. Ralim died, Borna's cadaver crumbled into dust and the people turned, hailing King Kull. Kull was very satisfied with the result and paid Fen Gur handsomely. Comments: Created by: John Arcudy (story) and Ernie Chan (art). Fen Gur's illusion and animation had some lifeless bones resemble King Borna's rotten body. or any other "Fen" character. Ralim was a normal man who pretended to be King Borna's son and the rightful heir to the throne. Ralim convinced part of the Valusian population that he had the right to be on the throne and, hiding behind his followers, asked to Kull to leave the throne. For days, Ralim increased his popularity and Kull could not kill him without shedding the blood of his own subjects. When the number of his followers became great, Ralim assaulted the Royal Palace. Astonishingly, he was "welcomed" by the walking, would-be cadaver of King Borna, who wanted to embrace "his son". Ralim's deceitful nature could not bear the terror and he confessed the truth, but he was killed anyway by the illusion created by Fen Gur. Selrac was a citizen of Valusia. He was one of Ralim's most loyal followers and truly believed that Ralim was the rightful heir to the throne. 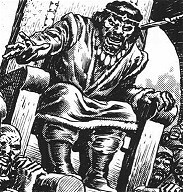 Selrac was present when Ralim challenged Kull to leave the Topaz Throne. 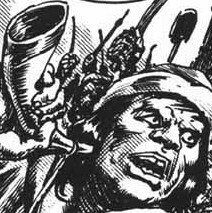 When Ralim saw that Kull was reaching him, even surrounded by hostile men, he ordered to Selrac to sound the retreat "to not see his people brutalized". Selrac believed him and the crowd retreated. Bakas convinced Kull not to kill his subjects.